I believe that using mouthwash, aside from flossing and brushing one’s teeth two to three times a day, should be part of everyone’s daily oral care regimen. I’ve been using mouthwash for years now, but I don’t stick to just one brand because I’m always looking for something better. I found some mouthwashes too strong, while others were too weak that they could not deliver what they promised. My search for the ideal mouthwash ended when I found Swish Mouthwash. 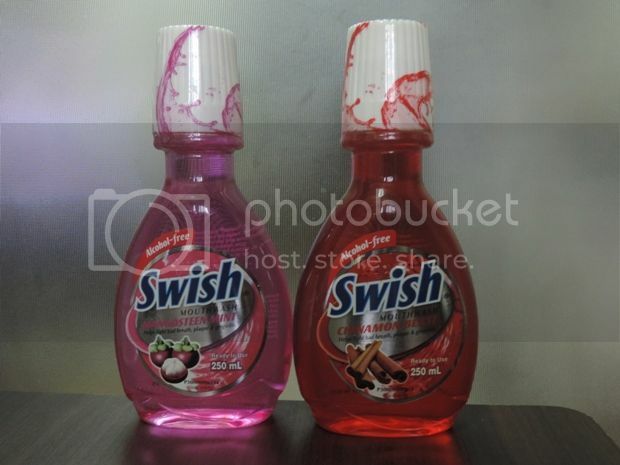 Swish Mouthwash is a product of Innovitelle, Inc., a subsidiary of Unilab. It’s safe to use by everyone including children 6 years old and above, cancer patients/survivors and pregnant women because it’s alcohol-free. It has Surefresh Technology that kills bad-breath-causing bacteria, prevents plaque build-up, gum disease and tooth decay, and leaves one with long-lasting fresh breath every day. Swish Mouthwash is available in 5 refreshing variants with various minty levels, ranging from gentle mint to intensely strong mint. Swish Mouthwash also comes in four different sizes at an affordable price: 35 ml (Php35.00), 60ml (Php46.75), 120ml (Php75.00) and 250ml (139.50). For best results, one can gargle 20ml of Swish mouthwash for 30 seconds. •	It has different minty levels to suit individual preferences. My current favorite Swish Mouthwash is Mangosteen Mint. It’s not too strong nor too gentle; its mint flavor is just right. •	I like its Surefresh Technology that not only kills bad breath-causing bacteria but also prevents plaque build-up, tooth decay and gum disease. •	It leaves no burning sensation on my tongue every time I gargle because it’s alcohol-free. •	It’s safe to use, so I allow my 7-year-old son to gargle with Swish Mouthwash, too. •	It’s very affordable compared to other brands. The biggest bottle (250ml) costs only Php139.50. •	The smallest bottle of Swish Mouthwash (35ml) is an ideal travel companion. •	It offers long-lasting breath protection. Have you tried Swish Mouthwash? Which variant do you like the most? This entry was posted in Arctic Chill, Cinnamon Blast, Icy Choco Mint, Mangosteen Mint, Peppermint Fresh, Surefresh Technology, Swish Mouthwash, UNILAB. Bookmark the permalink. I’ve tried swish and surprisingly it doesn’t sting! © 2013 Pensive Thoughts. Look At Me theme created by Squeesome.